June | 2009 | Shelf Elf: read, write, rave. If you are even a little bit obsessive in nature (ahem), and if you fancy yourself a foodie, you will probably find yourself envying Powell’s inspired/deranged idea. You will certainly find some laughs in her book, and she writes with a feisty honesty that appealed to me. Just a note – it seems that some people really hated Powell’s book, calling it boring / poorly written / self-absorbed and I can’t say that I agree. I’m thinking that said people were just jealous of the all of the attention Powell won through blogging about the project. 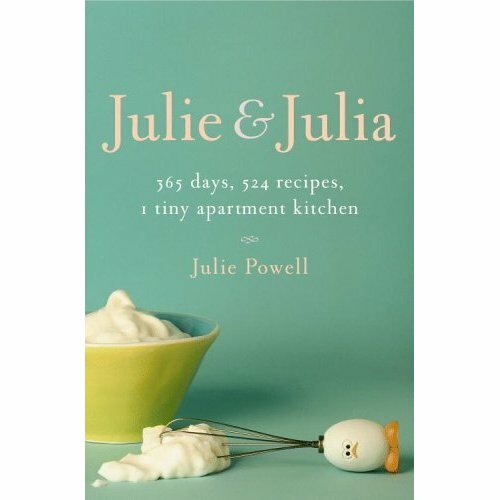 Julie and Julia was entertaining and it made me want to spend more time cooking this summer. It made me think about why some people cook, and how the type of foods we cook define us. 1) It’s an epistolary novel (love them love them love them!). Do I need to explain this? Consider a few other epistolary novels worth cheering about: Ella Minnow Pea (Mark Dunn), Feeling Sorry for Celia (Jaclyn Moriarty), A Bottle in the Gaza Sea (Valerie Zenatti), 84 Charing Cross Road (Helene Hanff). 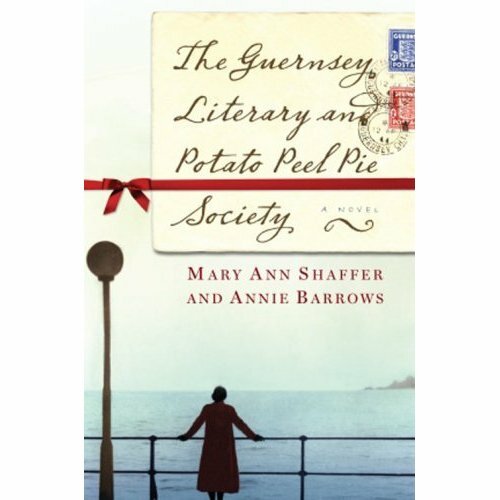 2) The tone is warm and quite often humorous, and you’ll put it down with a sigh of contentment, but the authors (Mary Ann Shaffer and Annie Barrows) reveal the horror of the war in numerous short scenes and tales throughout the novel, so that I’d say the overall effect is more poignant than heartwarming. 3) It’s a book about books – why they matter, our relationships to and with them, how they can bring people together. I enjoyed every page. Read it if you haven’t already. I’m guessing it will find a place on your shelf of favourites. This entry was posted in Adult on June 30, 2009 by shelfelf. To be read while dangling toes into the lake and drinking lemonade. Back with reviews in a few days! This entry was posted in General on June 26, 2009 by shelfelf. Hard to believe that the book is filled with illustrations as gorgeous as this. So let’s get to the interview! Welcome Grace! One of the themes in Where the Mountain Meets the Moon is the idea that while stories cost nothing, they have infinite value. Could you comment on this theme, and how it plays a role in your story? 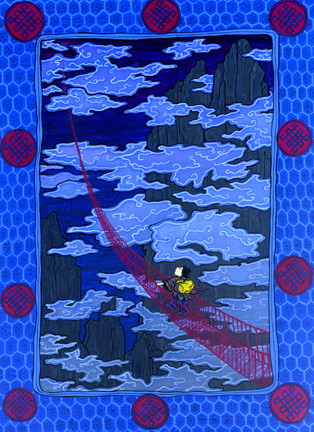 In “Where the Mountain Meets the Moon” the Old Man of the Moon talks about how everyone who meets are connected by a red thread. To me, those red threads, those connections are the stories we share. Stories as fascinating as a harrowing rescue or as inane as trying to find a parking spot—they are how we share our lives. A while ago, when one of my friend’s grandfather passed away I remember him saying one of his biggest regrets was not asking more about his grandfather’s experiences. “Now, those stories are gone,” he said. And the poignancy of this statement, the realization that we encapsulate our life, share our memories and connect with stories is what makes them invaluable. And this is, of course, one of the themes in the book. Ma (the mother) first disdains the stories that Ba (the father) tells, but as the story progresses it is the sharing of stories that help bring them together and makes her slowly reevaluate what she thought was valuable. 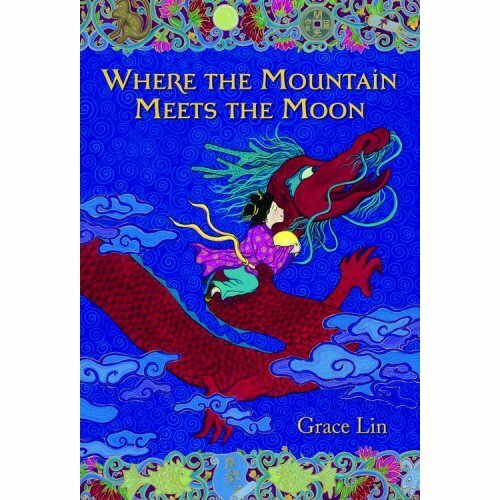 Where the Mountain Meets the Moon shows readers that reaching a destination is not only about having an objective, it’s also about having faith along the way. How has the journey of writing your novel led you in unexpected directions? What surprising things happened to you along the way? Well, writing “Where the Mountain Meets the Moon” was particularly emotional to me. I wrote about half of the book before my late husband, who had been ill with cancer for many years, passed. I felt a deep regret that I was unable to finish it before he died and was unsure if I would continue. But my good friend, Janet Wong said to me, “No, it is better this way. If you had finished it before, you would’ve felt like everything had to stay exactly the same. Now, you can feel like you have the ability to change.” Which was completely true and a revelation to me, not only for my book, but for my life. If you were given the chance to choose a creature to keep you company every day and convey wisdom, would you choose: a) a dragon, b) a goldfish, or c) a faithful water buffalo? I think I would choose the goldfish– it is the most peaceful, and there is something rather poetic about a goldfish in a bowl. I always feel inspired by brilliant colored fish. The dragon is tempting, but I think would cause too much attention from the neighbors and feeding a water buffalo would be a headache in the city. Ha ha. 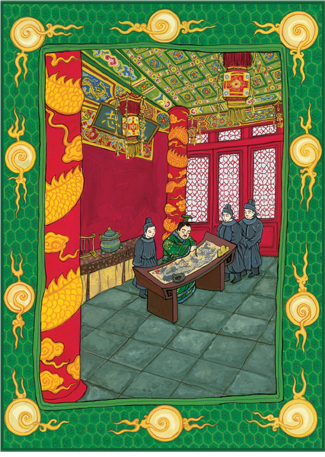 This entry was posted in Illustration, Interviews, Middle Grade on June 25, 2009 by shelfelf. Spooky and summer go so well together, don’t you think? If you’re in the mood for a thriller to sink into while lounging on the dock, I can’t think of a better recommendation than Tim Wynne Jones’ latest, The Uninvited. Sure to spook your socks off, the story captivates in true Tim Wynne Jones style. Mimi is desperate to get away, somewhere quiet and remote, somewhere far away from her mildly-stalkerish NYU professor/boyfriend. So she drives north, to her father’s cottage in Canada. It’s been years since he’s used the place, and when Mimi shows up she is shocked to discover there’s someone already living there. That person is Jay, a young musician who is using the rundown cottage as a space for writing his latest composition. When Jay first sees Mimi, he thinks she is the weirdo who is responsible for leaving strange and freaky things around the place – a dead bird and a snakeskin and other odd tokens. It doesn’t take long for the pair to realize that someone else is watching them both, someone who seems to want to frighten them, or worse. I’ll read anything Tim Wynne Jones writes. His stuff is literary but never self-consciously so, and he creates characters that I always wish I could keep company with just a little bit longer. This is exactly the case in The Uninvited. Jay and Mimi and Cramer, the third main character, are so well drawn that I believed in them completely. Their motivations are complex and their histories messy. Tim Wynne Jones should know a thing or two about writing suspense. His first book, Odd’s End, was a prize-winning thriller, and he’s done a bunch of much-praised suspenseful novels for young people since then. Everything in this latest book is woven together in ways you don’t see at first, and then slowly, you begin to put the pieces into place. The Uninvited is more than just a straightforward page-turner. It’s about creativity, family, lies and isolation. Oh, and the setting just rises right out of the pages till you can see the sun dappling the river and hear the wind through the trees. Perfect cottage book – just make sure you’ve got company. 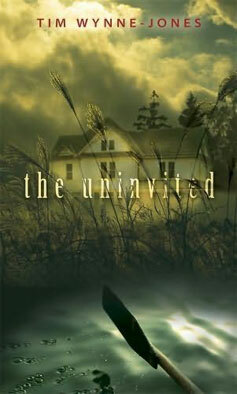 The Uninvited by Tim Wynne Jones is published by Candlewick, 2009. This entry was posted in Crossover Books, Teen/YA on June 23, 2009 by shelfelf. 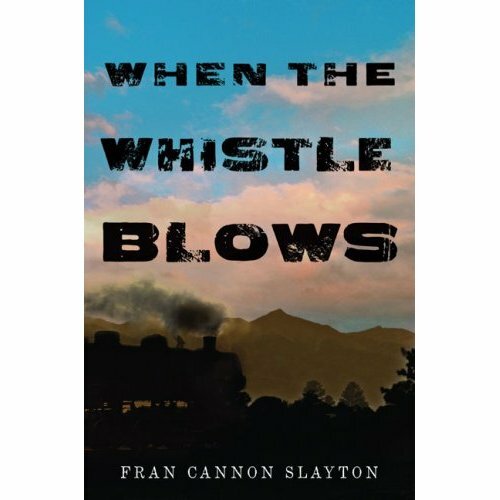 Fran Cannon Slayton’s debut, When the Whistle Blows, has garnered a lot of critical attention, earning praise all over the book world including starred reviews from Kirkus and School Library Journal. It’s one of those books that you read and can’t quite believe is the author’s first novel. It’s a beauty. You need to read it not just because everyone else loves it. Read it because this is a story that will sneak up on you and leave you with the feeling that you’ve just read something that has all the makings of a classic. When the Whistle Blows is the story of Jimmy Cannon, who lives in Rowlesburg, West Virginia. It’s the 1940s and the railroad is the lifeblood of the town, and it is also Jimmy’s passion. He is crazy about steam trains, and he dreams of working on the railroad just like his dad, who is the Baltimore and Ohio foreman. Jimmy’s dad doesn’t want his son to choose this life, because he predicts that the new diesel technology will cut railroad jobs dramatically. Yet Jimmy doesn’t want to walk away from the future he has always imagined. The railroad is a part of his family and his identity. Each chapter in the novel is set on All Hallows’ Eve (Jimmy’s father’s birthday), between the years 1943-1949, so we watch Jimmy grow up from age 12 to 18. We follow Jimmy as he orchestrates pranks with his buddies, when he sneaks a look inside his father’s secret society, on the day of his high school football Championship game, and one night when he has a close encounter with a train. This novel is a marvelous snapshot of small town boyhood in the 1940s. Fran Cannon Slayton really makes you understand the railroad and its huge significance to the people of Rowlesburg. Even though this novel is set long ago, it has real resonance in the current economic climate as lots of people struggle with letting go of livelihoods that they’ve known for decades. Really, just as much as this is a tremendously believable and rich coming of age story, it’s about change in a larger sense too. The change of a community and an entire society. Jimmy’s dad tells him, “Change comes Jimmy. It’ll thunder down the tracks towards you like an engine with the brakes gone out. And sometimes, there ain’t a dagburn thing you can do to stop it.” Jimmy learns what it means to face change and to make choices about whether to stand up against it, or to adapt and keep moving. Woven into all of this is Jimmy’s complex relationship his father. Jimmy desperately wants to figure his dad out, but it takes him a long time to even begin to get to the bottom of his father’s mysterious past. I enjoyed the structure of Slayton’s book a great deal. Each chapter felt a bit like a self-contained short story, but they built upon each other and the overall effect was a richer appreciation of the characters and the family relationships. You really do get to watch Jimmy grow up, from an adventurous prankster / dreamer, into a young man who confronts loss and uncertainty for the first time. There’s romance, but it’s not of the lovey-dovey variety. It’s the romance of the railroad. You’ll feel it. In When the Whistle Blows, there’s rule-breaking and humor, loss and family secrets, all explored and mingled together with such deftness and clean writing that readers will certainly recognize Fran Cannon Slayton as a new writer to watch. When the Whistle Blows is published by Philomel, a division of Penguin Young Readers Group. 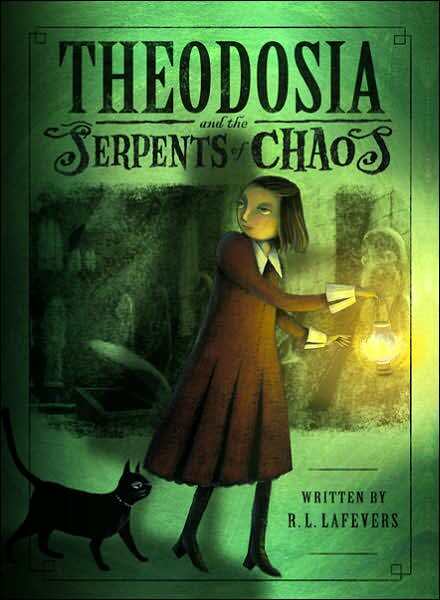 This entry was posted in Class of 2k9, Crossover Books, Middle Grade, Teen/YA on June 21, 2009 by shelfelf. 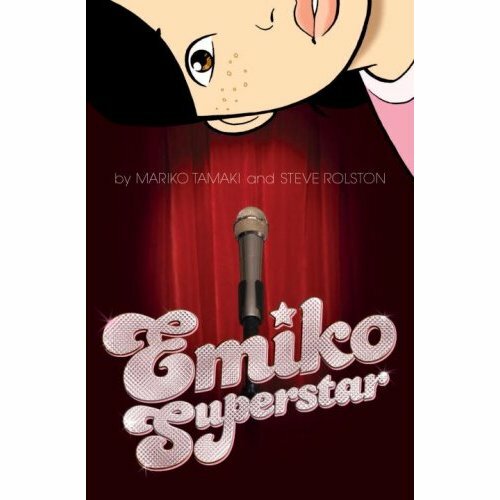 Emiko Superstar is a great read. It features a teen girl who finds her way to superstardom when she steps up to the mike at a local underground performing arts show called the Factory. Emi is looking to discover herself one summer, when all she’s got is a boring babysitting job in suburbia. This graphic novel traces her transformation, from geek supreme to spoken word queen.It’s the right book for all those who have ever felt on the outside and wished they could find their tribe. I don’t feel super eloquent these days (end-of-school-year syndrome). So it’ll just have to be enough for me to say that the book is really well done. The illustrations manage to be clean and simple in style, while still incorporating details that enrich the story and characters. Just take a look at Emi’s facial expressions and you’ll be amazed at the range of feeling that the artist communicates. The family dynamic in Emi’s house feels completely believable too – the mom who is a bit overbearing/overprotective and the dad who is sweet and tries hard and actually gets stuff more than you might think. But it’s Emi that really seals the deal. She’s right there on the edge of discovering her inner coolness, her talent and her community. She’s the kid you might not have noticed in high school who was actually destined to be this amazing artist. You’ll recognize her. There’s a quote on the back that feels pretty important to the overall aim of the book, “Not often, but every once in a while – amazing stuff happens to former geeks.” I must say, that I have to disagree on that. I think almost always, amazing stuff happens to former geeks. Emiko Superstar celebrates geek power, with style and subtlety. Guess that’s why it won this year’s Cybils Award in the YA Graphic Novel category. Read it. Write some poetry. Find your own underground arts scene and take to the stage. This entry was posted in Teen/YA on June 16, 2009 by shelfelf. When Scarlett Martin turns fifteen she is put in charge of the Empire Suite, one of the rooms in her family’s hotel. Enter Mrs. Amberson, an aging C-list starlet who decides to employ Scarlett. Soon, she is taking dictation, running around New York City , and getting caught up in Mrs. Amberson’s crazy adventures. 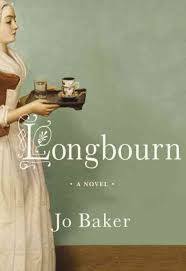 In the midst of it all, Scarlett falls in love–or so she thinks–and it takes Mrs. Amberson to help her see the light. All you need to do is drop off a comment, sharing your best or worst hotel story ever. Winners will be announced sometime during the first week of July. Visit www.thisispoint.com for more on the book. This entry was posted in Teen/YA on June 15, 2009 by shelfelf. whatever else the Elf is into. Elf trinkets, Elf accessories, Elf ears. Like my Jeremy Tankard Banner?